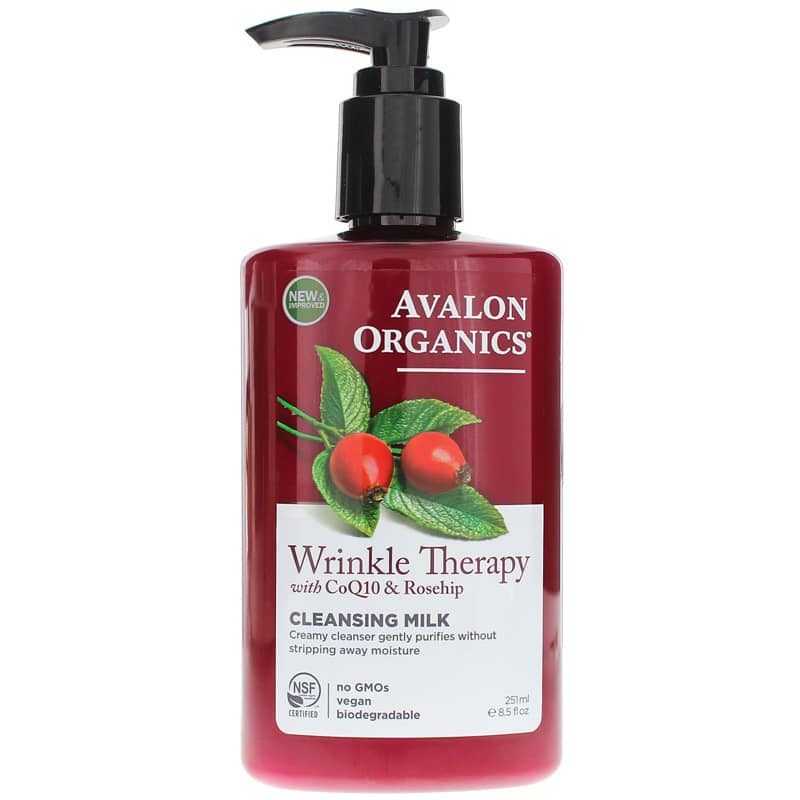 Wrinkle Therapy with CoQ10 & Rosehip from Avalon Organics is a creamy cleanser that gently purifies skin without stripping away moisture. 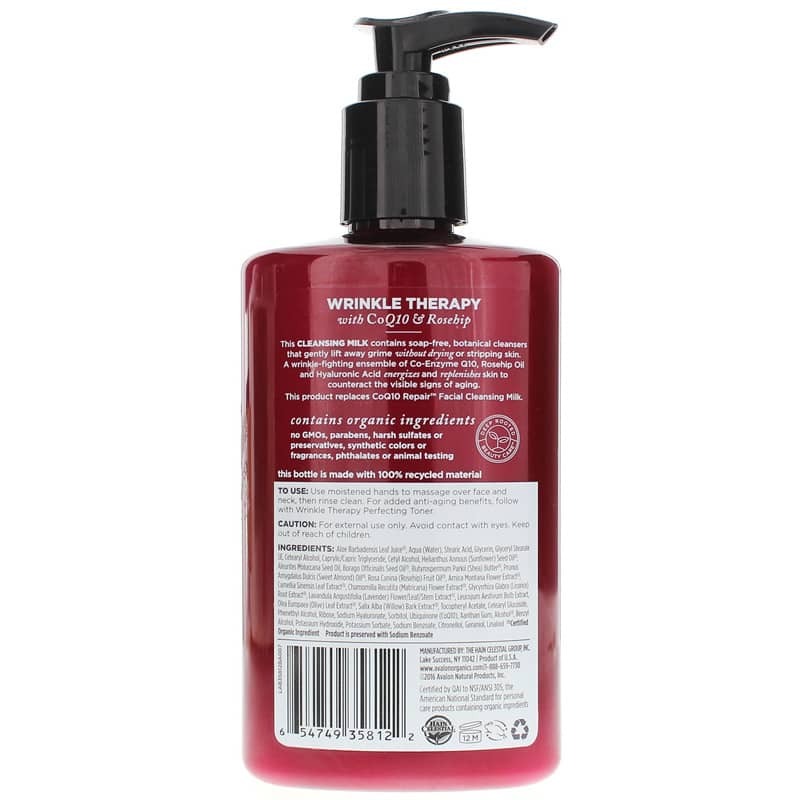 Contains soap-free, botanical cleansers that gently lift away grime without drying or stripping skin. Replaces CoQ10 Repair Facial Cleansing Milk. Now contains antioxidant-intensive rosehip oil for added wrinkle-fighting benefits. Aloe Barbadensis Leaf Juice(1), Aqua (Water), Stearic Acid, Glycerin, Glyceryl Stearate SE, Cetearyl Alcohol, Caprylic/Capric Triglyceride, Cetyl Alcohol, Helianthus Annuus (Sunflower) Seed Oil(1), Aleurites Moluccana Seed Oil, Borago Officinalis Seed Oil(1), Butyrospermum Parkii (Shea) Butter(1), Prunus Amygdalus Dulcis (Sweet Almond) Oil(1), Rosa Canina (Rosehip) Seed Oil(1), Arnica Montana Flower Extract(1), Camellia Sinensis Leaf Extract(1), Chamomilla Recutita (Matricaria) Flower Extract(1), Glycyrrhiza Glabra (Licorice) Root Extract(1), Lavandula Angustifolia (Lavender) Flower/Leaf/Stem Extract(1), Leucojum Aestivum Bulb Extract, Olea Europaea (Olive) Leaf Extract(1), Salix Alba (Willow) Bark Extract(1), Tocopheryl Acetate, Cetearyl Glucoside, Phenethyl Alcohol, Ribose, Sodium Hyaluronate, Sorbitol, Ubiquinone (CoQ10), Xanthan Gum, Alcohol(1), Benzyl Alcohol, Potassium Hydroxide, Potassium Sorbate, Sodium Benzoate, Citronellol, Geraniol, Linalool. Product is preserved with Sodium Benzoate.